A wildlife research vessel has set sail to monitor marine mammals during the NATO Joint Warrior military exercise. The crew of Silurian, owned by the Hebridean Whale and Dolphin Trust (HWDT), will be joined by a team of volunteer observers. They will conduct visual and acoustic surveys and the data collected will be used to determine any effects on the behaviour and occurrence of the sea creatures during the two-week exercise. Joint Warrior is a UK led exercise conducted annually in the spring and the autumn in the waters off the west coast of Scotland. A total of 5,700 military personnel from armed forces around the world will be involved, alongside 31 warships and submarines, as well as 67 aircraft. Among the ships taking part is HMS Cattistock, a Royal Navy Hunt-class mine countermeasures vessel. It left Faslane base and began heading north earlier this week. The ship has been working with mine clearance divers who have been using mixed gas diving kit. Some of the activity has centred around Kyle of Lochalsh where a Command and Control Cabin at the Qineti BUTEC facility has been conducting post mission analysis of unmanned systems. Among the unmanned systems being used are the Seafox underwater vehicle and the Blackstat Fixed Wing Unmanned Aerial Vehicle. Military sonar, used during the exercises, emits intense noise that can disturb and harm whales and dolphins, because they rely on sound for navigation, foraging and communication. Naval sonar, more commonly linked to mass stranding events of deep diving whales, has also been associated with minke whale strandings in the Bahamas and in North Carolina. 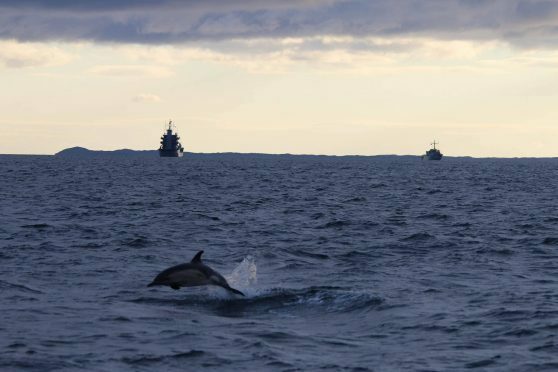 Lauren Hartny-Mills, HWDT’s science officer, said: “During previous surveys, which have coincided with the Joint Warrior exercises, HWDT has observed minke whales moving at high speed and leaping clear of the water, at the same time as military sonar was detected on the hydrophone (an underwater microphone). On the west coast of the US, close to Seattle, similar rapid fleeing behaviour in response to sonar has been observed in killer whales and dolphins. During the exercise, the trust is asking people in the area to be vigilant and report any sightings of marine mammals in the area. Sightings can be reported on the HWDT website (www.hwdt.org) or by calling 01688 302620. Pippa Garrard, HWDT’s community engagement officer, said: “With such a large survey area, HWDT depends on the public to report their encounters.